Prague finally has a big Eternal tournament. The organizer, Jan “Zuzy” Zuskač decided to organize something like Ovino or BoM here in our lovely capital, but unlike those other tournaments, this was something a little bit more relaxed. As he said, “by players, for players,” and I must say it was the best Legacy event I have attended in a long time. It took place in a university students’ hall in a lovely part of Prague. We were basically surrounded by hills, parks, and embassies. It was also beautifully quiet around here. I love it. 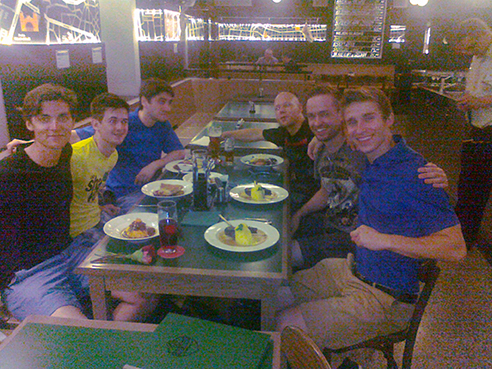 The only trouble with the place was that there was no Internet, so the Prague Eternal team could not stream live. The videos will be published later (and hopefully featured here on Eternal Central). Another great thing was that quite a few very good foreign players were coming: Julian Knab, Felix Munch, Johannes Gutbrod, just to name a few. 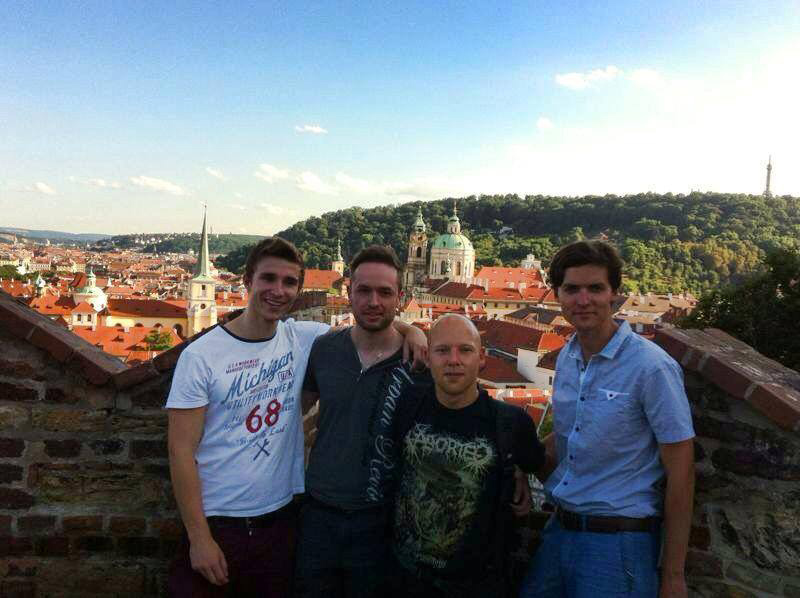 Johannes even accepted my offer, and with his friends (they are all called Dominik) decided to stay at my place. I got my Miracles decklist from a friend, Philipp “the Miracles innovator” Schönegger (aka Einherjer). Every time Philipp tells me about a new decklist/card he is testing we discuss it, and I already know we are next levelling the field. Or he is, to be precise. No Spell Pierce – I never really liked this card. It was too situational for my liking, but it seemed to be what one would call a necessary evil. And yes, sometimes we really hit Vial turn one or Jace or something like that. The matchup against Ad Nauseam Tendrils, Reanimanor and particulary Sneak and Show got worse by this change (we still have one extra Counterbalance), but I am not too worried. To beat Show and Tell decks we need some degree of luck anyway (and a fantastic sideboard, which we have). 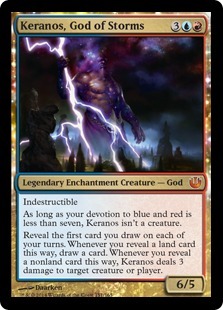 Keranos, God of Storms – Philipp told me to play him, Johannes told me to play him, and I was still not sure. Entreat is so good and it just kills the opponent. During seatings on Saturday I talked to some German player who started telling me epic stories about hopeless Jund and Junk decks that are so scared of Entreat so they even bring Surgical Extraction out of the sideboard, only to be humiliated by an unremovable God. Sounds good to me. Council’s Judgment – simply amazing card. I guess this is the last card we missed for our deck to be perfect. Maindeck answer for resolved Jace, Liliana, Library, but also True-Name Nemesis or Nimble Mongoose. The most brutal pre-board cards against us are: Liliana of the Veil (everybody knows that), and Chalice of the Void, which if it resolves, before our own Sensei’s Divining Top, is backbreaking. It is pretty cool against Batterskull as well since the opponent has to bounce it, and we can then kill that pesky Mother of Runes. We can even flash it back with Tiago. And it is another 3 casting cost spell for Counterbalance, which should not be overlooked. On Friday I played in the trial. I had byes already from a 50 person tournament in May. I started well by beating 4c Tempo with Stifles. I hate Stifle. It is so much better for us that people do not run them anymore. I won the first one with double Terminus. In the second he drew three cards with Ponder and since judge was standing just next to him I asked what to do. I can promise you that I really did not know this was a clear game loss violation. The first one was close – I even had to play Snapcaster with nothing in the grave to prevent me from going down to 3 from an incoming attack, which is something you don’t really want against a bolt deck. But I was able to overcome this and win the match eventually. I was then paired against Goblins in a very intense and close match that took like half an hour. My opponent Marcelo from Brazil played Ringleader about 7 times, but it was still not enough. Angels got there. Starting off 3-0 I felt really confident until I played against Aggro Loam in the next round. I was completely humiliated. I almost felt like I am playing an event deck here, instead of the most powerful Legacy beast. He was on the play and I kept (what I thought was) a perfect hand with Brainstorm, Ponder, double fetchland, Island, Top, Counterbalance. Well, maybe not so perfect. He started his turn with Mox and land into Chalice of the Void set to 1. GG. In the second game I kept very similar hand without Top but I was on play. I played my cantrip and I did not find anything relevant, and he went for the same again on turn 1. Then there was a Counterbalance from me next turn, and he followed up with Choke. GG. This was TOO quick. My place is only something like 35m but all five of us managed to find a place to sleep. With Johannes we were discussing sideboarding until like 3 am. Ondřej is a very good player from Czech Republic. He won the Friday Legacy Trial and guess what? He is running the very same 75 that I am!. Both games were extremely interesting as they went back and forth multiple times. The crucial moment of the game was when after we each countered two counterbalances, I tapped Top in my turn to play Jace with him having only one card in hand. He tapped his Top to get another blue card and Forced. On his turn he played Jace, fatesealed putting my Top to bottom. But I knew what was the next card was, Council’s Judgement! I won from there. The second game was similar to the first one. Ondřej was unlucky with his Counterbalance since he never really had anything relevant on top of his library. When I was taking over with Top, Counterbalance, and Jace, he Entreated during his draw step. I had only two untapped lands with one of them being fetch. Both my Explosives were gone (one destroyed, one destroyed his Counterbalance) so I needed to find the Force of Will. On the second Top attempt after shuffling with my fetchland I found it, and that was the game. I was a bit lucky but I was confident during the game with my plays (not so much with the sideboarding, as the FOW is very strong here). Ondřej got the decklist from me, and felt that I possibly know the deck and the match up much better. Pascal is another good player, and hails from Dortmund. And he hates football. I saw him yesterday dismantling ANT with BUG Landstill – secretly the best deck in Legacy, and for Miracles one of our worst matchups. This game he started with Volcanic Island into Sensei’s Divining Top. I had only two cantrips and one land. My first Ponder shows me Force of Will but no other land. So I shuffle assuming he is playing Miracles today, and he killed me on the next turn! Next game was not much of the game as Pascal kept on playing lands but nothing else. Clique and two Snapcasters quickly got there. In the decisive game I soon had Top, Top and Counterbalance in play. That was destroyed, but 2 Flusterstorms on the top are close to unbeatable. I even forgot to attack with Clique when he was on 4 life, realizing it half second after I said: go! But the game was quickly and decisively wrapped up. Counterspell or even Flusterstorm on top of the library is very hard for ANT to beat. My friend Martin Vonásek who plays Storm even runs 2 Pithing Needle in the sideboard for this circumstance (and others), which is very good! Pascal was very serious during the games since he wanted to play at his best – something I really understand and can appreciate. On the next day we had a great chat about our pet deck BUG Landstill, and he even gave his decklist. Thank you – It looks great! A German player was flying high with this cute deck that completely destroyed me with multiple Ghost Quarters in the first game. I am bringing Rest in Peaces in, and with him running Abrupt Decays all Counterbalances must stay in. I am not sure about the sideboarding here. I wanted to keep in at least some Forces, which may be wrong since he does not have any real bombs. In the second game I was able to lock him out of the game with 2cc and 3cc on the top of the deck with Counterbalance in play. After I played Rest in Peace I suggested that he should scoop third game, and he did that a bit late, but better than nothing. I had double Counterbalance in play, along with a Top, and a Clique eating away at his 40 life. In the last game he did not have much at the beginning. He played Slaughter Games which was a little bit surprising. I hid both Swords to Plowshares on top with Brainstorm which was what I expected him to name since past that I do not really have any other answers for his Marit Lage. He named Rest in Peace instead, and until the end of the game I did not find another Swords. The game went on and I Cliqued him soon after, and he revealed Crucible of Worlds, Life from the Loam, and two lands that were irrelevant. He did not even have a Wasteland in grave nor Dark Depths. I let him keep everything, and Disenchanted his Crucible end of turn. Clique was joined by Snapcaster, and they both started beating. I had Angels on the top but was still unable to effectively Entreat because of his three Rishadan Ports. He drew Faithless Looting and assembled the combo. At 10 life he could have gone for it but decided to wait one more turn. On five life I attacked with Clique and Snapcaster, and he created his 20/20 flyerand blocked Clique and went down to 3. I played Jace and bounced it. Next turn I attacked with caster putting him down to 1 and play Keranos! On my next upkeep I read the card three times to make sure I knew it worked, then I activated the Top and killed him. Bam! Robert is another German player and the first player I faced who made Top 8. The first game is pretty one sided. I start with Top, manage to have a Force of Will on the top of the deck when he goes for it on turn 3. The second game was really interesting. I was a bit stuck on lands – in the whole game I played four of them. On the other my hand involved all the good cards. He started but did not do whole a lot and for a first few turns just kept on playing lands. I had a Force of Will and a Counterspell and still decided to shuffle away Counterbalance – I could sense he has a Abrupt Decay or two in his hand and tapping out seemed strange if I can counter his discard and then Force his real business. I also saw Young Pyromancer and killed it with Swords. We went to extra time and I could almost see myself in the Top 8. At the end of the round I played Brainstorm just like that to dig deeper putting Force of Will on top with two Divining Tops in play. I attacked with my Snapcaster and passed. Robert played Cabal Therapy. He knew my hand so I decided to play another Snapcaster and target Brainstorm. He went for it. In response to his Infernal on the stack and no cards in hand I Brainstormed, then looked on top…no blue card. Oh no! A draw. A loss and a win from here will still get me to the Top 8! This game I kept a hand that was not the best: 3 lands, 2 Forces, and 2 Counterspells. It looks ok, but can turn out to be a complete disaster. I Forceded his first turn Goblin Guide, allowing him to resolve his Grim Lavamancer. Soon I drew Divining Top into Entreat for 2 angels, controlling the game with Counterspell and a Force of Will until the end. One of our best Legacy players, who looks like he is 13 years old. He finished in the Top 16 at GP Amsterdam. We play almost every week, and I only win like 3 games out of 5. Drawing makes sense for both of us, so we ID. He ended up entering the Top 8 in the first seed, while I was second. That means we will have a right to start to start in the first game of all our matches in the Top 8. This is really a big deal. This game was simply embarrassing. I had the cards to win and I even won in the end, but not without making many mistakes. The most tragic result of my fatigue was when I had to ask 4 times (!) in a single game if I have or if I have not played a land. After I asked the same question for the third time the audience started to laugh and judge sat down to our table to follow what is going on. When I asked for the fourth time and looked hopelessly at the judge he apologized because he was not looking. I always thought when people are asking this question they can’t be serious; you always know! Well it can be even worse. In the first game I had everything. Top, Terminus, Swords, Counterspells, and lands. He had almost nothing with 2 Liliana in hand and no third land. In this game I even flashbacked Force of Will so I guess you get the idea how difficult it was. The next game was not very interesting, as I did not have Divining Top, nor a stable manabase. I only managed to Flusterstorm his Hymn. He then Wasted half of my lands with a single Wasteland and we went onto the next one. In the decisive game I had only a basic Island at the start. A crucial point was when I Exploded both of his creatures on turn 3. At some point I naturally drew Entreat the Angels. He Pondered and Brainstormed looking for his singleton Maelstorm Pulse, and then scooped. Yes! You can read Kai’s tournament report here. We split prizes before the match. Some of my friends felt I should not do that, as it is my best matchup, but I never do that. I think people should always split the finals. That makes us both winners and that is what really matters. I was really tired and played poorly accordingly. Like really poorly. In the first game I could not a find Force of Will, so I Pondered and kept – pretending I got it. I do not think he noticed this interaction. He killed me on his second turn ignoring the Top. I had Top but he was slowly stripping me of the cards. His turn 1 Young Pyromancer attacked into a “Clique-trap” which I think was a mistake from Kai. Eventually I Exploded his tokens, Forced his Top, and another Clique put Xantid Swarm on the bottom of his library. I Swordsed another Swarm only to be forced to counter third one and that was it – from there I did not have another blue card to stop him from killing me with Tendrils of Agony. My first loss today resulted in a prize of 2 Underground Seas and 2 Bayous. Great! After congratulating my opponent on the victory he fully deserved, we went to a great restaurant not far from my place for a fantastic dinner. On the way Igor bought a flower from homeless person for his wife, to apologize for being that late. Inspired by him I bought three roses for a girl I fancy. Unfortunately she lives about 2500km away. In the meantime Costa Rica missed two penalty shots. Then we went to a disco. Johannes said “After playing all day Magic, girls seem so beautiful!” Isn’t that great? Miracles proved to be a top contender yet again. If you want to crush everything (except for 12 Post, that’s about it) you want to be playing this deck. It is important to understand that this deck is really complicated. You have to know what to do and when, how to stack the top of your library, that it is a really good idea to remember what is there and in what order, how to work with fetchlands, how many hits from opposing creatures you can take, and so on. And you must do all of that quickly in order to finish your rounds on time. I have been playing this deck since 2012. In three Grand Prixs with this deck – Gent, Strasbourg, and Paris – I have only lost 5 matches, but I drew 9! It took me a long time to play this deck faster than my friend playing Burn. It is important to know when to scoop and – be very polite here – from time to time you can suggest your opponent to scoop to save time. On the other hand, several times I have played various BUG decks against Miracles (which should be a bad matchup for Miracles), and although being a better player, and doing everything I was supposed to do, I still have a feeling that if only my opponents had done something a little bit differently I would not have won it. I mean this deck is a real powerhouse. This is most certainly the best Miracles decklist I have ever played. Give it a try! It was a fantastic tournament with many great players, and even better plays. I hope there will be another similar tournament here in Prague. If you have never been here you are missing a lot: a truly magical city, everything is really cheap (particularly the beer that costs less than a glass of water), and of course some really good Legacy! I think Zuzy mentioned he wants to organize another one this autumn. I hope to see you there!